Hire Henna By Salma in Arcadia and make your event alive. The Halloween decorations are down and you regret not getting your kids henna tattoos in Pasadena when you decided to spend the holiday at your Mom’s across town. Who says it is too late? You can hire a henna artist in Arcadia just like in Pasadena. Better start looking now. The beauty of henna tattoos is that they make any ensemble come alive. A lot of wedding parties in the country are taking their cue from traditional Indian weddings and hiring henna artists prior to the receptions. Why? Imagine a white wedding with ornate henna tattoos on the bride’s hands as she holds a bouquet of posies and walks down the aisle. And if she has a henna tattoo, the bridesmaids and best woman will be sporting their own tats too. Talk about a themed wedding. Think awesome wedding pictures. Yes, parents even hire henna artists to celebrate their kids’ Bar Mitzvahs. Festivities often ensue after the religious ceremony is over. Besides dancing and music, the celebrations sometimes include henna artists. The artists are especially popular at bat mitzvahs. Make sure that the henna artists you hire make only use organic ingredients to make their own blend of henna powder. Stay away from henna artists who offer to “add some color” to bar or bat mitzvahs with either red or black henna. Any henna that comes in a cone isn’t organic henna paste. It is made from chemicals such as PPD, a chemical that is known to cause nasty abrasions on the skin if a customer happens to be sensitive to it; and which a lot of people are. You don’t want to explain to parents why their little girls are sporting rings of blisters shaped like the word “Mazal Tov” on their hands. The general purpose of henna is to celebrate. A henna tattoo can help a cancer survivor celebrate the fact that she conquered a disease that most people sadly don’t. It can help a bride celebrate her big day in style. But most of all, it helps you celebrate YOU. 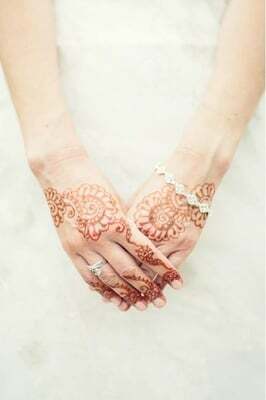 Henna tattoos can add flair to any event. Of course, you can only get the most out of the art if you hire the right henna artist. Where? Let’s just say that you won’t find anyone who specializes in henna design in any store in Santa Anita Mall. But one thing is for sure; Henna By Salma in Arcadia is sure to make your event an instant hit.